Stains can make any woodworking project look professional and stand out. Furthermore, this kind of coating protects wood from water and sunbeams. There are so many different formulas and types of stain that you can become overwhelmed with all of the options available. 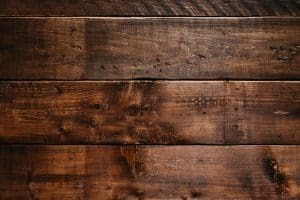 Here are 10 best wood stains for various situations and an explanation of all the features so you can know exactly what you are looking for. 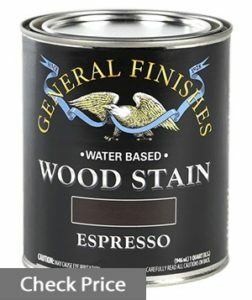 This option by General Finishes is the most popular wood stain. It’s a heavy-bodied formula that only penetrates just below the surface of your projects. It is a gel stain that’s designed to reduce spillage and uneven coating. By the way, you can apply it with any standard foam brush for staining or sponges. This product works very well for more difficult to stain woods like pine. Gel stains like this one are great for woods that typically absorb a lot of stain. You’ll waste less product from over-absorption and spilling. The shading and coloring leave a professional finish with minimal touch-ups. A single coating will give a nice finish, and 3 coats will yield the maximum richness that this tone of stain can produce. Drying time is around eight hours before you can add another coat. Above all, this product is perfect for interior wood. This is one of my favorite products I use to restore wood furniture. I use it quite a bit on the tops of my furniture that I restore and there are a couple of things why I love this product so much. Number one – it’s affordable and number two – it’s just awesome. 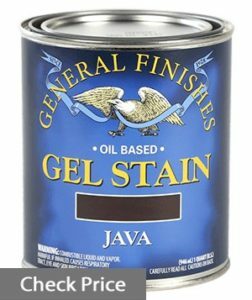 General Finishes have got a whole line of different colors and Java is my favorite. I just love this color – it’s so dark and rich. Java color has really worked well with many of the paint combinations. It really makes woodgrain noticeable. I know that some people apply this stain with rags but I find if I use a foam brush that I’m using less of the product. Some people may say ‘oh it’s not as fast’ but I’m okay with that, to me it’s all about application and getting it on evenly. Someone who doesn’t have much experience in finishing woods will be able to easily work with it without making a big mess because it applies very well with a cloth rag or foam brush. You should be careful when applying this product by making sure you don’t put too much on in a single coat. It may require more sanding than liquid stains because of its thickness. Minwax is the brand of choice for a majority of professional woodworkers. It penetrates deeply into most woods in order to bring out the grains to the surface. It’s designed to evenly highlight the greatest features and subtle styling of the woods you use. It’s meant to be used along with a sealer for a high-gloss finished product. The color scheme amplifies the existing qualities of your project. This option works perfectly for new projects. It penetrates deeply into the wood and requires minimal sanding. You can use a foam brush, standard brush, or cloth rag to apply it. You can use this on cabinets, furniture, trim, and just about any unfinished woods. You’ll experience a very uniform coloring with one to two coats. It’s easy to thin with mineral spirits to get a lighter tone if you need to. Liquid stains won’t apply easily with a roller. It’s easy to spill so you’ll need to be a little extra careful when using a brush. Older woods that are very dehydrated might take a liberal amount for good results. It doesn’t show up well when applying to an existing finish. Minwax makes reliable products that will work great for new projects. This is a good option for those who already have experience in woodworking. Rust-Oleum is highly-regarded for their exceptional quality stains and paints that are one of the best paints for wood on the market. This one focuses on a fast drying time and is intended for single-coat applications. It features a rubberized utility coating with a medium-bodied thickness that will seal against water and help fill existing cracks. 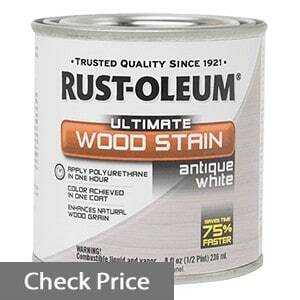 Rust-Oleum stain seals against leaks and moisture damages. You can apply it with any standard brush fairly easily. It’s thick enough to fill gaps and cracks in hard to reach areas when used liberally. A standard application will usually dry within one hour after applying. You can expect to get great coloring from a single coat. This product works best with wood floors, indoor furniture, cabinets and more. It’s not suitable for exterior wood projects. You should only use this for interior projects. It may be easy to apply too much and experience runs on your finished product. You’ll get great results on interior projects. Dry time is fast and convenient with no sealing necessary. 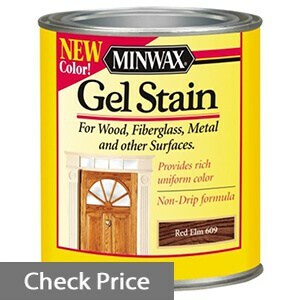 Minwax gel stains are suitable for a variety of materials. You can apply this product to wood, fiberglass, metals, and more. It features an easy-to-use no-drip formula. It is heavy-bodied and can be applied with a standard brush, roller, or cloth. You can use this option with any indoor project that isn’t exposed to the elements. It doesn’t necessarily require multiple coatings for even coverage. You can apply it with a regular brush or roller without much spillage. The average woodworker will find this formula very easy to use on most projects. It’s perfect for doors, banisters, trim, and other vertical surfaces. You may have to do a lot of sanding if you intend on adding a sealer. For fine woodworking projects, you may need to wipe down the area after you finish each coating to remove excess stain. You shouldn’t add mineral spirits to this product. You may experience streaks and runs on your project if you don’t wipe away the excess of your product. You’ll get the most out of this gel stain by using on projects that suffer from a lot of wear in normal use. It’s a good option for interior banisters, doors, and trim. Water-based stains from General Finishes don’t have any harsh chemicals or toxic vapors. They’re intended for indoor use only and is made to be easy to clean up if you have any spills. This package comes in a one-quart container. It is a medium-bodied water-based stain. Some water-based stains are very watery, but this Whitewash from General Finishes is much thicker than other brands. It’s easy to apply with sponges and cloth rags. You can use it with a roller if you apply it slowly. You can blend and thin this one with mineral spirits as much as you’d like to. The thick formula makes it simple to get an even coating with little sanding between coats. You’ll get a really good finish on softwoods and hardwoods alike. You can use it indoors with little ventilation because it doesn’t contain any harsh chemicals that create toxic vapors. You can clean up spills with mild-soaps and water. You’ll get the most out of this product on natural wood walls, trim, and interior doors. You might want to apply a sealer for your final finish on certain projects because this product isn’t hard to smudge and wear off. You might have to apply multiple coats to darker woods. This option won’t cover non-wood surfaces very well. It’s only suitable for indoor use. Do-It-Yourself woodworkers will really enjoy using this stain to add a rustic feel to their home. It has a very traditional look if you don’t add a sealer. 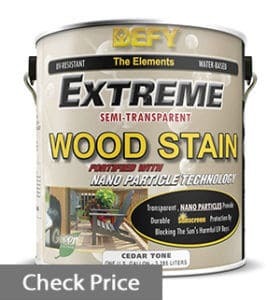 This product by Defy Extreme is a water-based exterior stain. It features an environmentally friendly formula that’s mainly intended for decks, pressure treated wood, and wooden patio furniture. Wood grains show through a semi-transparent layer with a matte finish for a natural look. High-Quality Resins in this formula add durability against weather and scratching. The resin also fights against fading. It includes zinc nano-particles that reduce the growth of mold. You’ll get a lot of value from this stain on outdoor projects that experience a lot of constant moisture. It will seal and protect against the elements exceptionally well. It’s best used on pressure-treated woods that are meant for exterior use. It has great features like added zinc particles that reduce mold and mildew. The resin in the formula stops fading, so you’ll get a longer lifespan from this option on decking than most other brands on the market. Cleanup is easy because it’s water-based. You can use a standard brush to apply it. You don’t need to strip this stain when putting on a maintenance coat later on. No Sanding Is Required. This one is somewhat more complicated to apply than others. You’ll need to make sure that you evenly coat your project a few times to get the best mildew-resistance. 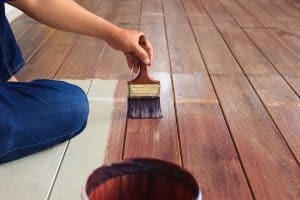 Striping isn’t necessary when maintaining, but you will have to purchase Defy Wood Brightener that needs to be applied before you do a maintenance coating. You can not apply this stain to an existing finish that isn’t of the same brand. A new deck project would be ideal for this product. You’ll need to completely remove your previous stain or finish if it’s not Defy brand. Maintenance is simple and it lasts a very long time. Old Masters gel stains are highly pigmented and oil-based. The focus of this product is providing intense colors on virtually any surface. You can use it on interior or exterior projects. It’s suitable for woods, metals, fiberglass, and composite materials. A single coating is all that’s needed in most applications. This package contains one-quart of exceptionally-rich Dark Walnut stain. The best quality of Old Masters products is their incredibly rich colors. This product is extremely thick which makes it perfect for exterior applications with minimal fading over long periods of time. You can simulate a realistic wood grain over painted surfaces using the Old Masters Woodgraining Tool. It’s easy to apply and isn’t likely to drip from your brush. This option is not weather-resistant. The colors last a long time on outdoor projects, but you’ll absolutely need to add a protective sealer coating. You can’t add any thinning solutions to this mixture. Cleanup is tough. You’ll need to use a strong cleaning solvent or mineral spirits to clean up any spills if you make a mess. You’ll need to wait for a minimum of 24 hours of drying time before adding a top-coat. You have to sand the surface of any wood projects before you apply the first layer of stain. Someone who wants very distinct coloring and doesn’t mind the extra work involved will find this stain really useful. The Ready Seal good proof application doesn’t require any primer before using. You can apply this stain at any temperature. It has a built sealer. This deal includes a one-gallon container. It is an oil-based all-in-one stain and sealant. Ready Seal Has outdone themselves with this product. It features all of the best characteristics woodworkers are looking for in one product. It offers a streak-free and runs free-formula that’s great for beginner hobbyists. The sealant is built-in and deeply penetrates the wood to provide exceptional water resistance. It has anti-mildew and anti-mold properties. This product even protects against harmful UV rays and reduces fading over time. You can apply it at any temperature with no difference in results. It’s worth using on exterior projects, especially fences. It’s a medium-bodied formula with above average coloring. There’s a lot of value for the price of this product. Sanding is optional but results in a more professional-looking finish. It can’t be thinned at all. If you add mineral spirits you’ll degrade the sealer, and reduce performance against the elements. It’s also very hard to clean up, so try to be extremely careful when applying. It’s not suitable for use with a roller. Anyone will see a lot of value in this product. It simplifies the process of wood staining with a professional quality end result. It’s perfect for exterior projects. 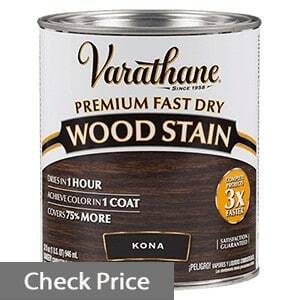 This Varathane Premium is one of their fastest drying oil-based formulas. It’s enhanced with microscopic pigmentation particles that give it a deep tone on any woods. This option is suitable for cabinets, doors, trim, and paneling. You should only use it for indoor projects. It dries to the touch in one hour. You can use thinning solutions with this stain. Any form of application brush or roller can be used. Cleanup is very easy. It doesn’t have very strong pigmentation. Your end result will look very dull if you don’t apply several coats. Direct Sunlight will cause this stain to fade eventually. You should not use this product on exterior projects even with sealant top-coatings because it will fade. It’s necessary that you excessively sand the wood surface with increasingly finer grit sandpaper before applying the first coat. The product has to be applied within temperatures of 60 to 90 degrees Fahrenheit. This stain will be good for someone who is just trying to get a project done quickly and save a few bucks in the process. 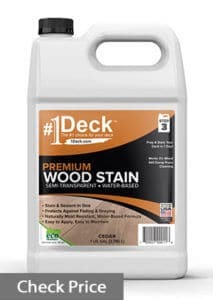 This #1 Deck product is an all-in-one stain and sealant. It is a semi-transparent finish with a flat and natural look. It’s water-based and environmentally friendly. You should use this product with softwoods in exterior projects. It protects against moisture and UV light. It has a low odor and is easily cleaned up with soapy water. It’s an average product without any other features that stand out from other brands, but it doesn’t suffer from any great downsides either. This is for exterior use only. You can’t thin it with mineral spirits or else the sealer mixture will be deteriorated. This is just an average product. There aren’t any great advantages or extreme disadvantages to using it. It’s somewhere in the middle and will be best suited for quick outdoor projects. There’s something about when you put a stain on natural wood and you get to see that woodgrain pop, it just gives you goosebumps. If you restore furniture you know what I’m talking about. When it comes to stains you can honestly have the best qualities of both worlds. You can have a durable product that also looks professional with enough care taken during the application. The first thing you need to do is determine what type of wood you’ve got. Softwoods like pine will absorb a stain much easier than a hardwood and thus could come off looking quite dark with even one coat of stain. Hardwood like oak and cherry on the other hand does not absorb stain as well and you may need to put several coats to actually get it to darken up to any significant extent. So here is how you determine what type of wood you actually have whether it be a hardwood or softwood. It’s easy to actually tell for the most part by just looking at the grain of the wood. With hardwood you’ll notice the grain is rather consistent throughout whereas softwood frequently can be blotchy and the grain isn’t consistent throughout the length of the bore. You should only choose a non-protective stain for aesthetic purposes when you want a very flat finish. For all other applications, you should just pick the best looking product with the most protective features possible. There are two main factors that will help you decide what type of stain to purchase. 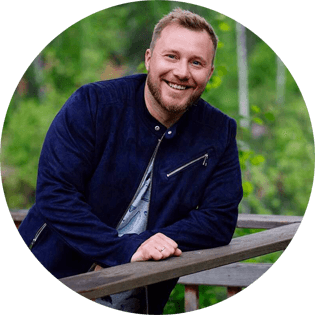 The first key point is the level of quality you want to see on your finished project. Fine woodworking projects like furniture and cabinets are typically going to need to look amazingly finished. Outdoor projects and trim isn’t going to be seen as closely, so it really doesn’t matter. The second key point is going to be how resilient you need your stain to be. An outdoor application should absolutely incorporate UV resistance, mold resistance, and water-proofing. Combination sealant and stain are usually going to be your most solid option for exterior products. Some brands that work for exterior applications might not look very great on finer quality woodworking projects. So I suggest you choose one of the wood sealers for your exterior wood to give it the protection it deserves. Because softwood can sometimes have an uneven grain or kind of a splotchy appearance it’s better to usually use some type of pre-stain conditioner on the wood itself prior to applying the stain. This will allow a more even look. Prior to actually stain the wood it’s important that it be sanded to the level that you’re looking for. Sandpaper is going to allow for a more difficult time for the stain to absorb into the wood and thus you’ll have a lighter appearance. If you use a coarser grade the wood will have a better ability to absorb the stain but it will have a rougher surface so you have a darker surface but a rougher looking texture. The supplies that you’re going to need: a foam brush or a regular brush, a pair of disposable gloves and lots of rags. Remember rags should not be too big because if you deal with a large one and you try to drag it and wipe the stain off you’ll find that the larger the rag some of it will get caught in the stain and then you’ll be dragging it all around the top of your piece so you’d like to have more control on the rags that you use. So cut them in smaller pieces that work for you. You can use a kind of a sponge brush or a regular type of stain brush and rags. The sponge brush absorbs some of the stain so that you can spread it evenly over the wood. Because stain is difficult to get off your hands it’s better to use a pair of vinyl or latex gloves to protect your hands from getting a stain on. In addition, it’s better to work in an open area or a bit well-ventilated area as the fumes from the stain are quite strong. To actually apply the stain you have to soak up some of it on the brush and rub it along the line or grain of the wood. Apply a liberal amount on the surface and let it sit on for approximately 5 to 15 minutes. The longer you wait the more time the stain has to absorb into the wood. Particularly with hardwoods because of the difficulty in absorbing into the surface you may need to put several coats on. So give 5 to 15 minutes of rest and then wipe it down with the rag. Use a clean rag and wipe down the stain in the direction of the grain of the wood. 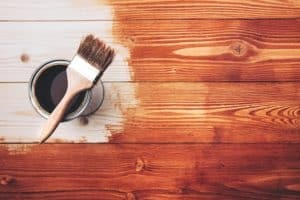 If you choose to put on a second coat to darken this up wait 4 to 6 hours and then apply a second coat again in the direction of the grain and let it dry for another 15 minutes and then again wipe off any excess stain. After you’ve got it darkened to the level that you’re interested in you can let this sit for approximately 8 hours or so and then put a couple coats of polyurethane on it to give it a shine and a protective finish. What a great article, William. I need your advice. I moved into a new house 3 month ago. There are beautiful pine cabinets in the bathroom. The walls and floor are pretty dart so I’d love the cabinets to be darker to make the bathroom look lovely-lovely. Should I paint them some dark color or stain? What do you think? Hi, Valeria. Choosing wood finish depends on what you want to get in the end. Definitely, wood stain is for you if you want to keep the natural wood grain visible which I think the most important and beauteous thing of the wood piece. Stain will show the wood grain and make it look darker just as you desire. On the other hand, paint will cover wood grain but there are much more colors to choose from, but paints got less dark colors than stains. None of this should be surprising, stains are designed especially to make your wood look darker. Also, each paint has different gloss whereas stain barely gives you any shin. 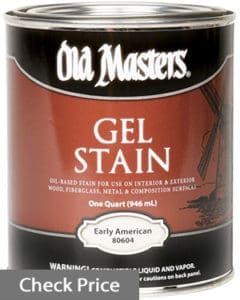 So for you, I suppose, the General Finishes Gel Stain will be the best solution since it’s well suited for hard-to-stain woods like pine. There are several deep dark colors available, but java is my favorite. I can guarantee you will love this murky brown color, it turns out a little bit lighter after you apply it, but it still looks awesome. Need your help. I and my wife want to stain unfinished bathroom door. Which stain is better? Hi. Staining doors isn’t as common as staining any other wooden piece but the outcome is always astonishing. Without a doubt you should go for gel stain rather than water-based, gel stains are well suited for vertical surfaces, I think you only will mess thing up trying to apply a water-based solution to your door. As I already said, gel stain is perfect here, so General Finishes Gel, Old Masters or Minwax Gel are out of the competition. 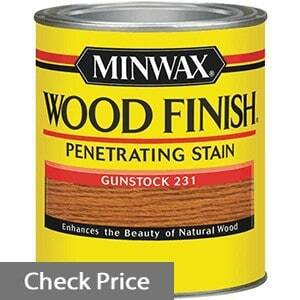 But Minwax Gel Stain will be the best option for you since it’s designed just for vertical surfaces. Pick up the color you like and you’re ready to go. It’s a good thing you mentioned what door you’re going to finish. Bathroom doors have to deal with constant moisture and warm air which cause wood corruption. Of course, it won’t happen in one day but it’s better to do your door properly right away so that it will last for a long time. So, if you want to protect your door then you should apply an extra topcoat after applying stain. You may have heard of wood sealers, they are the perfect finishes against the moisture and rotting, furthermore, they have a clear formula which means you will keep desired stain color. So for you, it’s pretty simple: stain the door, wait for it to dry completely and then apply wood sealer. I’ve got the article where I reviewed top sealers https://woodimprove.com/best-wood-sealers/. I think Waterlox will be perfect indoor sealer for your piece. Love your blog, William. I finally got my Old Masters stain two days ago to finish my porch oak table. I started staining the underneath and I realized that applying gel stain using a bristle brush is quite difficult for me. Stain kinda sticks to the brush and covers the wood unevenly forming rough level. What brush is more suitable for gel stain? Hi, Rebeca. It’s better to use foam brush or rag to apply gel stain but some brands may be applied using fine bristle brush without problems. By the way, I applied Old Master last time using exactly bristle brush, finish went easily and evenly. I suppose Old Masters might have changed their formula so that consistency of the product got more sticky. But most likely your stain wasn’t warm enough for proper finishing. It’s spring but weather is still chilly so do not use finishes once you get them delivered, let them warm up at room temperature. If you do so, the finish will perform at its best. Great post, go on writing, William. I’ve got a quick question. My VERY old wooden fence was barely finished as a result it started rotting and fall apart. The best solution was to replace it with new fence completely which I did. Now I want to finish it properly to avoid the same problems in the future. What stain would be the best for staining a fence? Also I know that sealer is must have for exterior wood that’s subject to weather and moisture. Wait for your answer, thanks. Thanks, Jacob. Glad to see you on my blog. You made the right decision: when wood starts decaying because it wasn’t prepared the right way initially it’s better to do all from scratch again. But sometimes it’s possible to repair wood using putty and other material, but fence isn’t a subject in this case: too much work, you know. You’re right, it’s highly recommended to use sealants for exterior wooden projects. But many exterior stains can seal wood too. 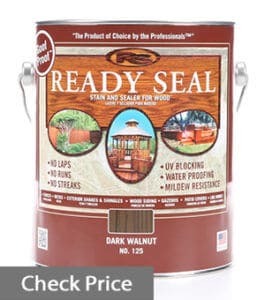 ‘Ready Seal Stain and Sealer’ seems to be made especially just for you. It’s great for exterior pieces like fence. Furthermore, it both stains and seals the wood so you won’t need to seek for good sealer. So pick up Ready Seal and you’re ready to go. Cherry wood is moderately heavy, hard, and strong. Because of this, cherry is great for staining. 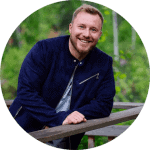 Hey William thanks for putting together some great resources. I am in a pickle. We have 3000sqft of new pressure treated pine fence. I want to take the steps to protect it. I would like to try and preserve its color along with protecting the fence but I am on a budget and if I can only do one I’d rather protect it from rotting. I know ready seal seems like the go to option for me but with the amount of coverage I need and how expensive/lack of coverage per gallon ready seal offers I’m looking at other options. Also if you buy stain and a clear sealant separate which one do you apply first? What do you recommend for me? For you I would recommend Agra-Life Lumber Seal . It’s a sealer which covers 2-3 times more than Ready Seal stain/sealer does. So if the coverage is your main concern then Agra-Life is the best choice, it’s great for fences. Apply sealer first, after that apply water-based wood stain.